Imagine yourself at a dinner party with six of your best friends – some are couples, some single. The only thing more abundant than the free-flowing drinks, appetizers, and rapid-fire conversations shooting across the table are the number of beeping, buzzing, and vibrating cell phone interruptions. Then someone suggests that you all play a game that goes like this: everyone is to place their cell phone in the center of the table with all phone calls and text messages to be read aloud. Knowing that a refusal to play might be interpreted as having something to hide, would you play? Are you secret free? That’s the dilemma at the heart of the new film from Mexican director Manolo Caro called Perfectos desconocidos, a retelling of the 2016 Italian film Perfetti Sconosciuti (Perfect Strangers). Of course everyone at the table agrees to play and we are along for the wild and entertaining ride into the darker side of technology and the ominous ways in which we are letting our cell phones not only control us, but to also define us. "has some pretty startling things to say about the way we use technology today"
Disconnected psychologist Eva (Cecilia Suarez, Netflix’s The House of Flowers) and her husband Alonso (Bruno Bichir) invite their best friends over for a house warming dinner party at their home. In attendance are Ernesto (Miguel Rodarte) who arrives with his wife, Flora (Mariana Treviño), Mario (Manuel Garcia-Rulfo) and spouse Ana (Ana Claudia Talancón). Pepe (Franky Martín) arrives single as his wife has come down with a sudden illness. 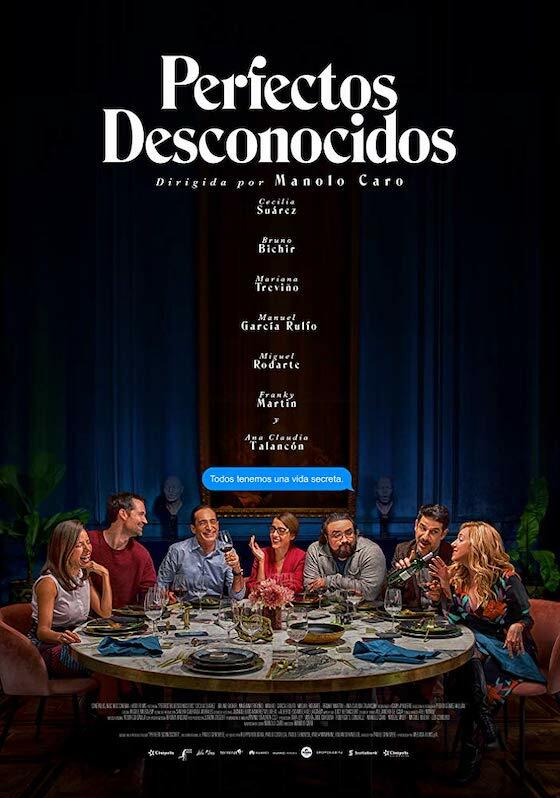 Perfectos desconocidos is a Spanish language English subtitled back-and-forth dialogue-fest with nearly the entire film taking place at a single dinner table where all the guests have placed their cell phones. With only the most brief of visits to the balcony to observe the ongoing lunar eclipse or to the kitchen and/or bath for private conversations, Caro’s camera ping pongs across the table as the first act spools out introductions and back stories with all the sordid relationships, inhibitions and obsessions. Things quickly get very interesting as the phone game begins where secrets are revealed and deceptive tactics are implemented by the guests with each ring, chime, or vibration. One of Caro’s biggest successes comes from the way in which his main setting begins to close in with a claustrophobic unease as conversations turn from mundane to saucy to accusatory. The phrase, “Oh! What a tangled web we weave, when first we practice to deceive” comes to mind as we begin to squirm at the cleverly laid out conundrums and dilemmas that are revealed with each phone call or text message. As expected, the topic of marital infidelity is hit upon early and often, but others creep into the unrest as well, including unannounced cosmetic enhancements and sexual orientation, the latter of which will certainly ring more true within the machismo of its Mexican and hispanic context. The brilliance of Filippo Bologna’s script comes from our realization that none of the guests is forced to play the game, yet they throw their phones in anyway. Wouldn’t we all do the same, knowing that lack of participation might draw speculation and accusation of something to hide? Add to that a very interesting conversation that gets into the challenging question of privacy and how much of it should spouses, partners, and friends expect. The film posits – quite convincingly, I might add – that we all harbor deep dark secrets and in this modern world of constant connectivity, the cell phone has become the key that unlocks and exposes them to the world. 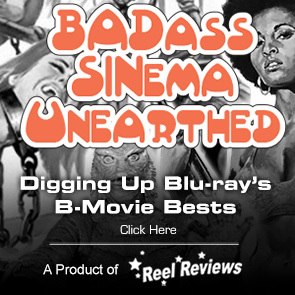 In spite of the many entangled themes and subjects the film takes on, none of it feels contrived or heavy-handed. That is, in part, thanks to Caro who works with a breezy pacing and manages wonderful chemistry from his ensemble cast that comes together nicely for a funny little film about friends, family, lovers, and spouses. Along the way, the film has some pretty startling things to say about the way we use technology today. Perhaps we need to put our cell phones down and pay more attention to our personal relationships! How's that for startling? MPAA Rating: R for some sexual content. Tagline: We all have secrets. Memorable Movie Quote: "How many couples wouldn't kill each other if they speaking to each other's cells." Synopsis: What begins as a provocative party game quickly becomes a wild ride full of twists and "textual tension" in this comedy about the secrets we all carry in our pockets.